Recently bassist Sam Kiszka of Greta Van Fleet took some time out while they are on tour to give their fans some insight into their musical beginnings, how the band developed, where their influences come from, and just where they are going. We may all be surprised as Greta Van Fleet reaches back to pull forward in a way that showcases their true identity of diversity and the techniques of who they really are as modern day musicians. 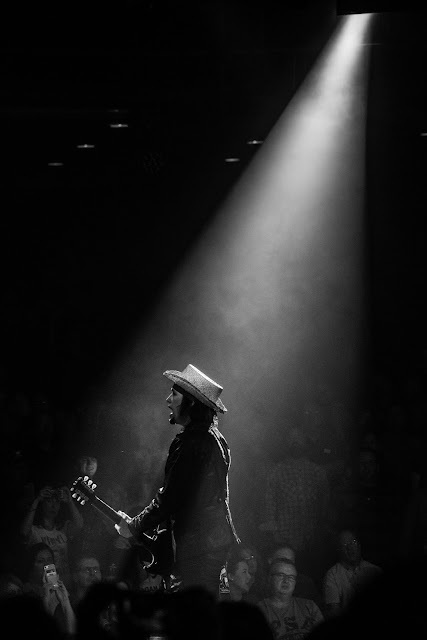 Song River: Listening to your four tracks over and over again this thought took form... not only can Great Van Fleet play and sing but the band collectively has a gift inside. - could one say that either you have it or you don't? Sam Kiszka: I don’t think I particularly have anything special, but musically I would be pretty much crippled without my brothers and best friend. Not only can I bring ideas to them, but they’ve taken them in a direction that is so unique, and the same thing I’d want to do with the ideas but didn’t know I wanted to do. Deep down, everyone has “it,” their own unique style, whether they are involved in business, art, politics, whatever. I think our band formed at the right time with the right people, and the universe has put everything in place. Song River: Growing up how did the introduction of what binds you all come together? Was your family just casual about their music? Sam Kiszka: Actually yes, our parents were very casual about music, they played it around the house, never forced it on us, they just liked it, and the music they played resonated with us. One of my earliest memories about music was discovering The Beatles and playing some of their songs on my iPod shuffle. After about a month of hearing those songs, I was ready for something new so I found some new songs and put them on my iPod. “Let It Be,” “Octopus Garden,” “I’m Looking Through You,” and so much more, all these great songs and I couldn’t believe were all by The Beatles! Song River: Curious question- were you home schooled/public schooled or private schooled? Sam Kiszka: We all went to public school. The Frankenmuth school district is one of the top 10 best schools in Michigan, fabulous school, great teachers, and EXCELLENT staff, all just fantastic people. I went there for all 12 grades and graduated with pride. Song River: Were music lessons in your repertoire of growing up? If so, where did you begin your training under classical or? Sam Kiszka: I never had a music lesson, ever. I think I started learning bass when I heard Creedence Clearwater Revival play “I Heard It Through the Grapevine.” I loved that riff, so I picked up dad’s bass, an off-brand Japanese bass that he hadn’t touched in five years. Jake and Kyle [Greta Van Fleet’s first drummer] were in our garage playing guitar and drums for hours and hours after school and I wanted to be part of it. So I learned that Creedence riff, I learned bass from listening to James Jamerson’s old Motown songs. Some of the best musicians are self-taught. I just read Eric Clapton’s autobiography and in it, he wrote about how he’d listen to Freddy King, BB King, he’d sit there and learn the licks. Then he’d record them on this old, cheap tape recorder he had and just keep practicing and recording, practicing and recording, and he’s one of the best guitarists ever. I wanted to learn his guitar solo on “Leyla,” so I watched him playing it on YouTube, four or five different performances. You learn the licks, you practice, and then you develop your own style by taking what you hear and experiencing it in your soul, then you can play it from the heart. Song River: How important is technique to each of you as you have grown with your own instrument of choice? Is there a particular artist for each of you that you have studied in depth to hone your own passion? Who among you can play multiple instruments? Sam Kiszka: We all have naturally experimental minds, our shared mentality has always been ‘what have we got to lose’ for just trying something new. I started on bass, it was fun but then I got bored and thought ‘well, I can’t just be a bass player,’ so I forced myself to learn keyboard. I listened to Elton John’s ‘Your Song,’ that was the first song I learned to play on the keyboard. I got into the jazz organist Jimmy Smith and learned to play more experimental music on keyboard. Then we found my great-grandpa’s Hammond M103 organ in our garage, the type of organ that Procal Harum played on ‘Whiter Shade of Pale.’ It’s such a beautiful instrument, beautiful curves, stunning finish, built with a heart, and we take it on the road with us - I’ll play the songs’ bass parts with the organ’s bass pedals. So, I play bass, keyboards, mandolin, guitar, drums (although I’m no Danny Wagner), a little electric guitar and ukulele. I’m getting back into saxophone and then I’ll learn to play lap steel guitar. Song River: How refined are you all in rock n roll history? Is it an important component to have hold of the roots for what you create? Sam Kiszka: I suppose the basics of rock’n’roll history are important, knowing the evolution from African music and the blues slowing turning into rock. It’s important to know where the roots are. I’m a history buff, I love music history and trivia, stories about different bands intersecting with each other, musicians’ careers and personal lives. I find that I understand their music on a deeper level knowing random trivia. Song River: Encouragement so often is the displaced portion of growing up. It often gets replaced with expectations. A balance is always necessary though- for each of you how did your informative years find that balance and even still today as you've all reached the age of 18 do you keep the balance individually and collectively? Sam Kiszka: We were just encouraged by our parents, the only expectations were from ourselves. I will strive to be the best musician in the world, but that’s not going to happen. But I’ll still try. Our parents were not stern, they were very encouraging with us about school, our creative exploits, everything. Sam Kiszka: We have a sister, Veronica, she’s older than me and younger than Josh and Jake. Compared to most people, we have a smaller family; we know everyone on our mom’s side. We always joke that Danny has family everywhere, he’s got like three-to-four trillion cousins, uncles, aunts, random family in random places. He also has a younger sister, Josie. Song River: Of those family members what are some of the different creative processes going on? Sam Kiszka: Veronica in Hawaii is learning to dive. Our entire family is adventurous, we’re always going out doing things, we strive for bigger success, no settling. We’re not the kind of people who would be satisfied working normal job hours, we like to make our own rules. Song River: Coming from a town just shy of 5,000 folks (according to the 2010 census) the best thing Frankenmuth is known for is chicken dinners and Christmas, as Bronners is the tourist trap! First, what was it like growing up in the middle of America in a state known formerly for Detroit autos and many other things? Sam Kiszka: Frankenmuth was a great place to grow up in every way. There are so many places in Michigan that are rich with history, especially Frankenmuth. I think that Detroit is in an upward spiral, maybe the next Nashville in a couple of years. If you go north of Frankenmuth, there are so much untouched forests and land, our souls run wild up there, the depth of the forests, the log cabins. And the acts that have come out of Detroit and Motown - MC5, Stevie Wonder, Grand Funk, Bob Seger, so many. Song River: Second, is it time for Frankenmuth to add to their list of 'known for' the creative soul kick ace rocking and rolling band- Greta Van Fleet? And just how is that notoriety sitting so far? Sam Kiszka: I’m not sure about adding us to what Frankenmuth is known for! It’s weird, we know lots of great musicians living in Frankenmuth, and we love to have them come over and jam. Maybe it’s something in the water! I’m on the inside so I don’t know what GVF means to other people. We put out a song and you never really know what that song will mean to someone. Song River: Are any of you surprised at how quickly this all became fan-driven and took off like a rocket? Sam Kiszka: Absolutely. We can’t even fathom how much has happened in the past could of months. We signed with Lava Records, ‘Highway Tune’ started to explode on the radio, people are coming to concerts, people who want to see us. We never expected this. I believe in our music, our initial goal is to make music we want to listen to. Song River: What took place in order of succession? Band, wrote music, found manager, label heard, PR came, tour set? How did this all unfold? Sam Kiszka: That is the correct order, and we’ve been writing music all the time. We found Mike [the band’s first manager, now tour manager] before Danny got in the band. Kyle left the band, Danny joined, then we got to the point where we took new management, we signed with Lava. We’re very blessed to have all of these people on our side, people pushing for us. Touring is going so great, it’s fantastic seeing new places, meeting new people, and the best part is playing our set every night. Song River: Sure any rock n roll history nut can hear a multitude of those who came before in a band- what sets Greta Van Fleet apart in your own words? (I have my opinion but I want you all to describe how you hear and feel it be your own). 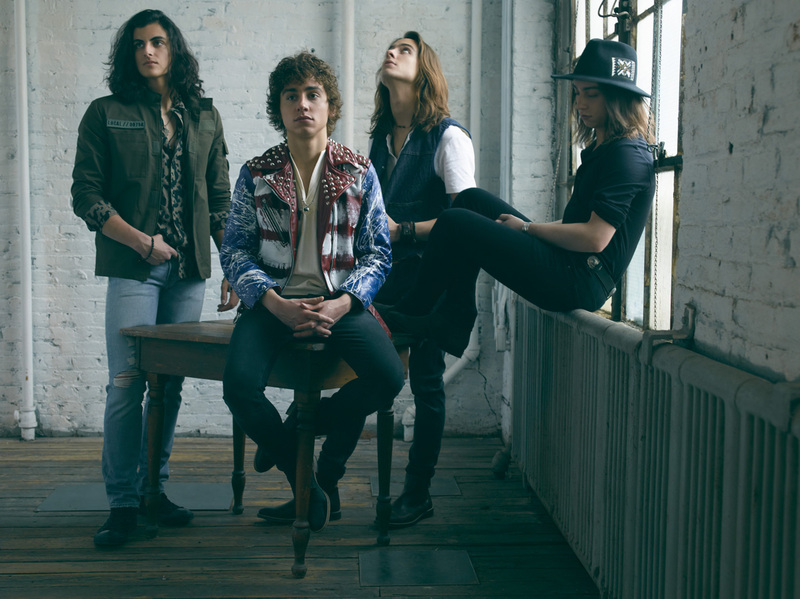 Sam Kiszka: I think what really sets us apart is the time our music is coming, right now, it’s coming at a time when your stereo is not receiving signals of authentic music. And it’s time for that to change. 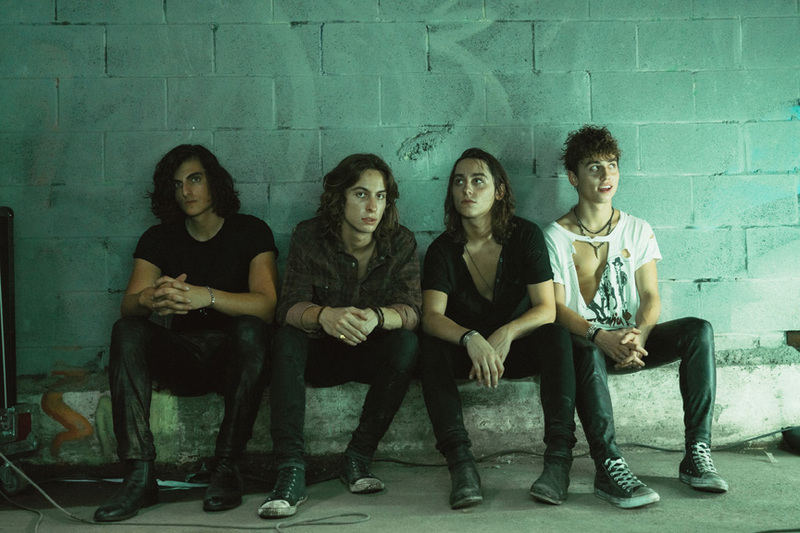 Greta Van Fleet has a chance to bring authentic blues/rock back into the popular scene. We are three brothers and a best friend, we really love each other, we write all of our songs together and we put power behind our music in this modern scene. Song River: Talk about the four songs chosen first to be released: "Highway Tune" "Flower Power" "Black Smoke" "Safari Song" as each seems to tell their own story and stand on their own. Where did the stories come from and how did these four get chosen to be your debut? Sam Kiszka: We chose these four songs for our debut as they show our rock side. “Highway Tune” is the first song we ever wrote and “Black Smoke Rising” was written fairly recently. “Highway Tune” is a shock of energy, power, adrenaline, the definition of a rock song. “Flower Power” shows a different side of us, it’s more folky, airy, light, and has a theme of energy and power, inspiration. “Safari Song” is very bluesy, percussion-driven, and Josh’s vocals shine on ‘Safari Song,’ gives me goosebumps. “Black Smoke Rising” presents a different direction for the band, it has a higher meaning than the other songs, it’s more serious, like an omen. We’ve written a bunch of new songs since, and we’re excited to show people other sides of us, we’re not just rock’n’roll. Song River: A debut of four tracks, music video, tons of radio opportunities, a tour- is there even downtime right now, if so when you catch it- what are some of your favorite books to read, movies to watch and other outside music things to do? Sam Kiszka: No, we don’t have much downtime. Our van is comfortable for a couple of hours, but that’s about it. We keep ourselves entertained, we have acoustic guitars in van, we jam, we write, we listen to music, talk about music, it’s never boring. It’s nice to be able to read in the van. I love to read and I read lots of biographies on musicians. Right now I’m reading a book of Ernest Hemingway’s short stories. He was a Michigan guy, he spent time in his cabin, so I can relate to places he wrote about. Song River: Ultimately what is it you want to contribute while here on your journey and what is it you would like to take in exchange? Sam Kiszka: We would like to take everyone with us on our journey. We want to give back to the universe, pump the energy back out, see everyone go wild when we play live, and have the audience take the energy back out into the world. We want people to get inspired when they hear music, to give back to the world, give to charity, make a soundtrack that people can relate to, put happiness back into the world which I think it needs right now. Personally, for me, I feel so lucky to be put in this place, this time, with these people, to make beautiful music. Danny’s injuries were predictable and the possibilities presented , given that tour management has overloaded the upcoming calendar, can be daunting. My suggestion is that they hire a temporary drummer, someone experienced who can handle. a temporary position. That way Danny can completely recover and work on how it came to this. Part of the problem is Danny himself. Watching band interviews it became obvious that his personality is less projected than the brothers, he tends not to speak out, partially because the Kiszkas are all naturally able to handle energetic conversation where Danny tends to take a step bacwards, hence not revealing how serious the injury to his finger is and how much pain he tried to obscure. On his part that was not an intelligent choice though admirable on another level. His situation now can be very tricky for the band as, when on the road, he will not havethe secure care he needs, unless they hire someone. Honestly, I am unsure about the next year, knowing how tight they are as a group, as mates and as brothers. Tough choices may face them and management and label need to take charge and possibly slow down what has been a meteoric rise.